So what is it about camping that creates so many fond memories? Greg believes church camps have such a big impact because they provide the opportunity to separate yourself from day-to-day pressures, and have the space to spend time in a community with God. “One of the great things about camping is that people have the chance to get away from their regular pressures and responsibilities,” he said. “This creates space for interaction with God, with nature, with people and with themselves. “Many people will share their stories of how they met a significant friend or even life partner on a camping trip of one kind or another. “Others will tell stories about their sense of call to ministry of one kind or another coming into clear and sharp focus during a camping experience. Greg has been involved with church camps throughout his 30 years of ministry, from family camps, youth camps, day camps, congregational camps, adventure camps, mission camps, minister’s retreats and overseas trips. 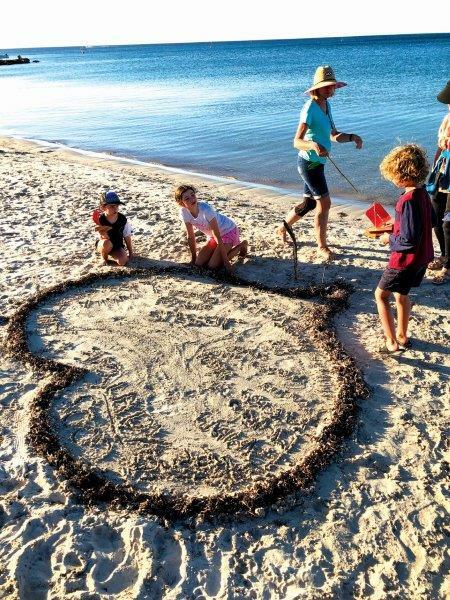 Recently, Greg organised the second annual Messy Church Summer Camp, held in January at the Uniting Church Campsite in Busselton. The camp ran for almost three weeks, inviting families to stay for a night, a week or the entire time to join in the activities at this beachside site. Campers were invited to participate in fun and games during the day, and an activity each night, following the Messy Church philosophy – all age, hands-on worship including a celebration and a meal. At just $10 a day for campers, who provide their own food, it’s an affordable way to engage with people of all ages. In recent years, church camps – and every other church activity – has made changes to how they are run, to make sure all who attend have a safe, welcoming and enjoyable experience. Greg said that while these changes have had an impact on organising camps, it is definitely not a barrier to running them. “Changes in safety legislation have in some cases made the Camping Ministry much more difficult, but with a change of mind-set that says ‘how do we make this work today’, I still think that most things are possible and the major focus is creating space for people to be together,” he said. Fun at the beach, at the Messy Church Summer Camp. Cindy Gorton, Safe Church/Royal Commission Officer for the Uniting Church WA, said that there are a number of requirements and risk management measures for camp organisers to consider these days, but that shouldn’t restrict age appropriate, adventurous activities being run while on the camp. Among other things, organisers need to consider that all adult leaders at the camp have a Working With Children Check, there is adequate supervision for all activities involving children and young people, sleeping arrangements are suitable, first aid and emergency planning is in place, registration forms collect any serious medical conditions and/or disability access requirements and that all leaders are briefed and know the camp guidelines and procedures. Cindy said for annual camps, it’s important to review any incidents and participant feedback, so that required changes and improvements can be made for these camps over the years. Kids’ Camp Out (KCO) is one annual Uniting Church WA camp that has been running successfully for decades. It caters to primary school aged kids, but now also encourages leadership from teenagers and young adults. Margaret Johnston, member of Forest Lakes Uniting Church, had been involved with organising KCO for more than twenty years, having made the decision to focus on congregational leadership at the camp in 2016. Having seen people grow from children to young adults in the church, Margaret feels camping can bring people together in great ways. “My congregation, which is very small, has three young adults who have grown up with us,” she said. “All have been going to KCO since they were old enough to do so and all have taken on leadership roles, not just because they went to camps, but because adults have been willing and interested to support and encourage them through the stages. “I can’t see any other way which will demonstrate how important they are and how much their involvement is valued. “The benefits of church camps in the Uniting Church WA setting are gained from the opportunity for individuals and groups from congregations to get together and share their church experiences. Now that the junior leader program at KCO is strong, the young adults can confidently take part in other events, be encouraged by their congregation leadership to participate in worship and be nominated and sponsored to participate in the meetings of the Uniting Church, locally and nationally. This has been strongly supported by Uniting Generations. “For the younger camp participants, they see the older ones continuing to be involved and that they are interested in staying with the church. Naomi Haslam, also a member of Forest Lakes Uniting Church, is one of the young adults who has grown up attending KCO, and various other church camps. She said that attending KCO helped her to be aware that she was part of something bigger. As a young adult, Naomi has attended the National Young Adults Leaders’ Conference (NYALC) run by the Uniting Church in Australia, been a Youthful Member at the 15th Triennial Assembly of the Uniting Church in Australia, as well as stepping into leadership roles at KCO. She said staying connected as an adult has helped shaped who she is today. “As an adult at NYALC, I found myself a space and a sense of greater connectivity and kindred spirits. It also fuelled my need for fellowship and discipleship. And these positive experiences have also influenced me into studying events and tourism,” she said. “I continue to be involved in camps as an adult because I realised I gain more out of an experience and the event based atmosphere in my faith formation and development. I want to be able to continue that growth and experience, hence why NYALC and even the Assembly youth program were such important events to me. Agreeing with Greg, Naomi said church camps provide campers with a space set apart from the stresses of regular life – a space to remove barriers and just be with God. Naomi would love to see more opportunities for teen and young adult camps in the Uniting Church WA. With the young adult network, Deep End, taking off, she hopes to see it supported further by the wider church, as well as support for young people to attend national Uniting Church camps, to further their faith formation. “I think there needs to be more opportunities for all to camp, and I think we need to redefine or even not limit ourselves by using the word ‘camp’. Kids’ Camp Out (KCO) is coming up fast, from Saturday 23 to Sunday 24 March for Kids in years 2 to 7, at Advent Park in Maida Vale. Junior Leaders, in school years 8 to 12, will meet at the site the evening before for leadership training, community building, and to help set up and get ready for campers to arrive. This year’s theme is ‘Grow’, inviting those present to explore the different ways they have grown over the years, to reflect on their life’s journey so far, and to look at how they are growing into the future. Organisers are inviting campers and leaders to bring photos from previous camps to be included in a photo wall showing the growth of the camp. For more info, speak to your local congregation leader or call Janine McDonald, Uniting Generations Co-ordinator, at the Uniting Church WA, on 9260 9800 or email janine.mcdonald@wa.uca.org.au. Follow KCO on Facebook at facebook.com/KCOWA. Find out more about Messy Church at messychurchaustralia.com.au. Connect with Deep End, a network for young people in the Uniting Church WA at facebook.com/DeepEndYA.